We left Boston at rush hour on a Monday and arrived In Dallas a little after 8pm. We picked up our rental car and headed to the very hip Belmont Hotel. After some good people watching and a couple beers at the hotel bar we hit the sack to prepare for a full day of museuming (is that a word?). 8:56 am: on our way to Fort Worth.. first stop the Kimball Art Museum. While bold in personality this small gem is everything I hoped it would be. 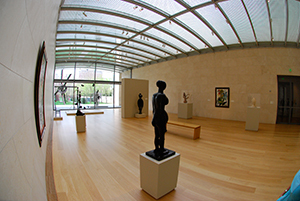 The use of natural light inside the galleries is clever and stunning. The clean classic lines of the interior and the use of concrete creates a wonderful backdrop for this amazing art collection. 11:03 am: still on schedule… walk across the street to The Modern. Wow. 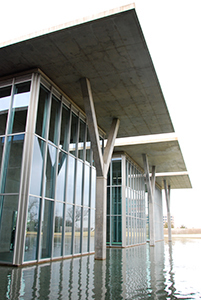 Designing a building next to a Kahn masterpiece is no easy task, but Ando delivers. 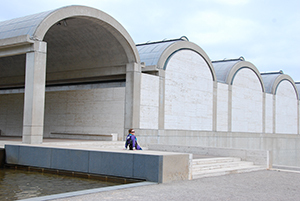 Using a similar vocabulary of concrete and repeating forms Ando’s work is distinctly modern, but it also emphasizes how timeless Kahn’s building is. 1:12 pm: The light is good so we need to take some more exterior shots of the Kimball.. then get in the car and head to Dallas. 2:09 pm: After a quick stop at Dealey Plaza on the way in to Dallas, we head to the Nasher Sculpture Center designed by Renzo Piano. Another excellent use of natural light, this time controlled by a cast aluminum sunscreen. The outdoor sculpture gallery is fun and varied. 4:37 pm: Almost time to head back to the airport, using Google and the trusty iPhone GPS we find the new Theater in the Dallas Center for the Performing Arts which is under construction. 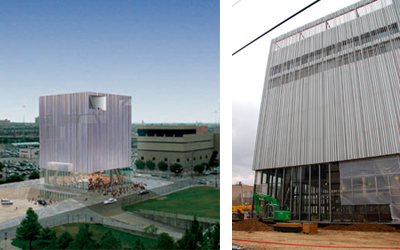 Designed by Rem Koolhaas, the theater is set to open in September 2009. While still under major construction, the vertical “pipes” which make up the dramatic exterior space are in place. Four major architects and three museums in 24 hours… not bad for a day’s work! I am overwhelmed with the amazing spaces and quality of detail I have seen.